I actually really, really, HATE highlighting, annotating or otherwise making a mark in a book that I've read or am reading. I feel like I'm degrading the author's masterpiece and destroying something that was perfect every time I do such a thing. 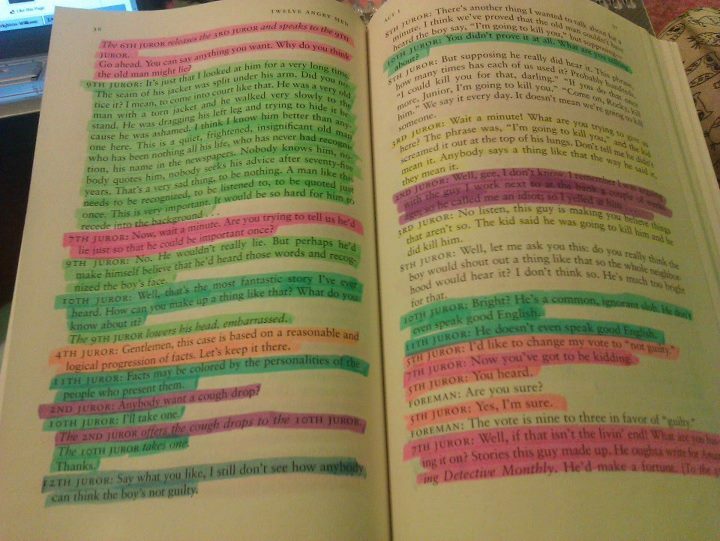 But for the sake of my own education, my copy of Twelve Angry Men by Reginald Rose has been transformed into a rainbow, because SOMEBODY decided not to give the character's names, which wouldn't bother me so much if it weren't for the fact that I need to write a text response on this book later this month, which means I have to know which character said what. Colour-coded jurors for the win!!! I'm just saying, 11th Juror is awesome. 10th Juror: Bright? He's a common ignorant slob. He don't even speak good English. 11th Juror: Doesn't even speak good English. Aah the irony of the German immigrant having better English skills than everybody else. 7th Juror: "I beg pardon?" What are you so polite about? 11th Juror: For the same reason you are not: it's the way I was brought up. I like this play, if you couldn't tell. What are your thoughts on making markings in a book? I want to shoot myself a little more every time I do it. How does it make you feel? P.S - Happy Father's Day to all the dads out there! I stray from markings too. I like my books nice and clean. I'm exactly the same! I forced myself to highlight on my books this year for the sake of gathering quotes, but I hate the thought of annotating my copies. I don't even like when people fold the corner of the page - why don't they just get a bookmark!? So yes, I like my books unmarked. I have really hard time doing it. When I was in college I did start out highlighting textbooks, but gave it up because entire pages turned yellow (back in my day, highlighters were yellow, dammit. And you kids, get off my lawn!). When I read now and come across a passage I really like, I copy it into a word document, but I just can't deface the book. Been a while since Twelve Angry Men for me, but I recall liking it quite a bit. And thanks for the wishes. I guess it's Aussie Dad's Day? Ours is in June. Hahaha it's okay, up until I decided to colour-code the jurors in Twelve Angry Men, I only had a yellow highlighter too. I had to go out and buy the other colours as soon as I decided it was the best option. I know that many students in high schools and universities highlight pages, but I never did it. Also never used marking. Just read everything again and again for exams. But if it's helpful for students to highlight .. then all the best. I know that they Mother's day and father's day. Do they ever have a children's day? I'm with you, Bonnee! It seems like sacrilege. It's the worst feeling, I feel like I'm vandalizing something! i've seen the movie, it's freakin' awesome! it's so tense, and just all dialogue. love it! Oh no, I couldn't do it!!! It makes sense, but if they're my books - the ones I've enjoyed reading, anyway - then I couldn't let it happen like that. They need to stay unmarked... though I'll happily donate anything by Jane Austen to the children. I'm not an Austen fan. I'm with you, it's hard for me to mark up books. I used to do it with much more abandon. I've back away from that. Not sure why. Maybe b/c after writing eight novels I know what goes into putting those words on the page. I hope soon i can read/understand all your posts ! Fight ! !